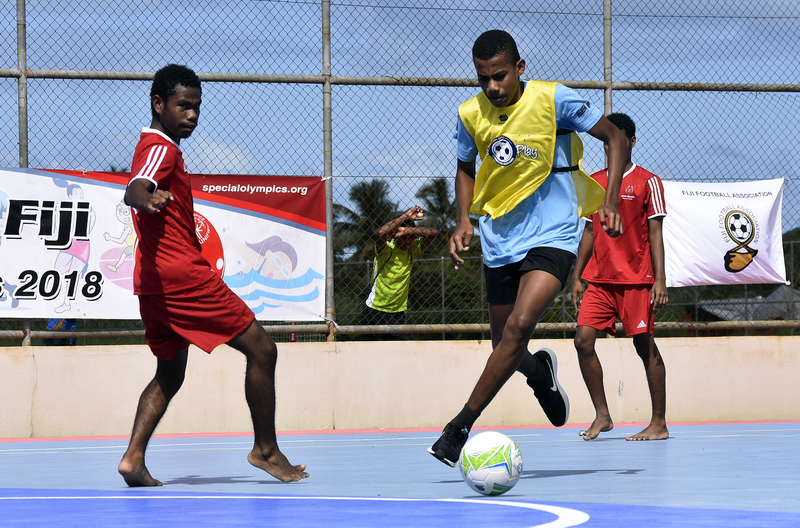 The Fiji Football Association hosted the futsal competition as part of the Special Olympics Fiji Regional Games at Fiji FA Futsal Court in Vatuwaqa. The pool matches were played on Tuesday and the semi-finals and finals were played on Thursday. Special Olympics Fiji Games Chairman Robin Dayal said they were very lucky to partnership with Fiji Football Association for the futsal competition. “We did try this last year with our locals and Tonga coming in but this year we thought with the 50th year celebration worldwide, we invited Rabi, Nauru, PNG and Samoa. We also invited Vanuatu and Solomon Islands but they could not make it,”Dayal said. Dayal said the participation of all these countries was a big boost for them. Dayal said after the competition they would see where the best they would fit in their players. Dayal said there was a huge interest shown by the special children in playing football. He said the main objective for the futsal competition was for the players to enjoy. “Yes they are here to enjoy football and I have no doubt that do not enjoy as anybody will see and would not believe these special children are capable off,”Dayal said. Fiji Football Association chief executive officer Mohammed Yusuf said it was their privilege to host the Special Olympics futsal Championship. “We are delighted to offer them our facilities free of charge, this is part of social responsibility to bring these people all-inclusive to feel they are just like us and our president Rajesh Patel was too happy to accommodate the Special Olympics,”Yusuf said. Yusuf said they had not only given the futsal court but also the hall for Tennis competition. “These is FIFA funded facilities and these what FIFA all about getting the smiles on the faces of people underprivileged and this was one way for Fiji Football to contribute to the society.” CEO said. Yusuf said he was impressed with the talents displayed by some of the players. “I think the world is moving in the right direction to make these children happy and competitive like a normal person and we could see the smiles and cheer on their faces which shows how happy they were, “Yusuf said. Yusuf said Fiji FA would continue to provide all assistant to Special Olympic committee. “Our philosophy speaks itself that “Equality and Unity through Football to Build a Better Fiji” and we always accommodate the people with disabilities free entry to all our games.” Yusuf concluded. Meanwhile Sigatoka won the championship defeating Suva 3-0 in the final to win the Gold medal.